One of the very cool things I can do with the iPhone 5 is eliminate carrying a separate GPS receiver when I’m hiking or biking. I downloaded an app called Gaia GPS. It turns the iPhone into a full featured GPS. The big improvement this has over my old Garmin eTrex Legend is the ability to display the underlying USGS topo maps for no additional cost. In the past, access to USGS maps for my computer was hundreds of dollars (keep in mind these maps are created by the government at taxpayer expense). So in effect, this app also replaced the combination of using my laptop with the Garmin. All for $20. 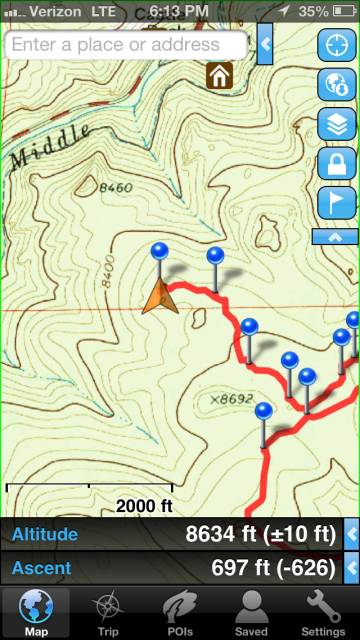 Normally the app pulls the maps from the internet as needed for an area, but it also has the ability to pre-download maps for an area for use where there is no cell signal. Another plus, I was able to transfer all of the routes and waypoints stored in my Garmin to the app. That’s about 7 years worth of stuff, most of it “off the beaten path”. On a lot of the local trails, I like to mark trail junctions because in the winter you can’t see the trail under the snow. I won’t go into everything the app can do, but it does everything my Garmin could do. 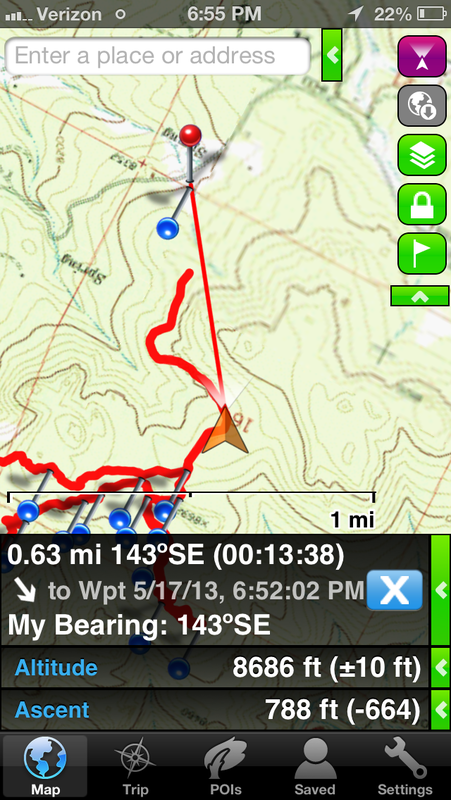 Here, the app is guiding me to a waypoint that I created on the map. The big downside is the battery usage. This is not the fault of the app. It’s because the phone is not optimized for GPS only usage. Recording a track is the biggest battery drain. On a full charge, I estimate 4-6 hours of track recording. Definitely not for backpacking use, where I’d be without power for days. However, the app does have a variety of power saving features that will stretch out the battery life for a full day of hiking, but nothing compared to weeks of constant use my old Garmin can do. But for 95% of what I do, it will be an improvement over the Garmin. Coupled with an Otterbox Defender case, I’ve got a fairly durable GPS for outdoor use. sounds like a cool app. when you first mentioned it i looked into it for my phone, and it would only be $10; not sure why there’s a price difference, other than perhaps simply android vs iphone? i’m jealous you have an otterbox case. i <3 them since they're a local (colorado) company; ft collins, even, my old stomping grounds way-back when. last i checked, otterbox doesn't make a case for my phone since it's got a slide-out qwerty. tricky for a smartphone. Interesting thing about the price difference. The Android app is version 4 and the iPhone is version 7. I know that Apple charges a developer fee, but that wouldn’t account for the $10 difference. Either way, it’s a great deal compared to what I’ve had to pay for things in the past, like map CDs. I currently have two cases. I have a Speck case for everyday use, and the Otterbox Defender for hiking. I’m considering buying another Defender case that I will permanently attach to the bike for trail riding. It’s cheaper than buying a dedicated bicycle case. I’m part of the Gaia GPS team. I’m glad you’re enjoying the app! Just to clarify, the Android and iOS versions of the app are developed separately, and as of May 2013, the Android version is priced differently because it’s not yet as mature or full-featured as the iOS version. However, we’re currently in the midst of a major overhaul of the Android version which should bring it up to parity with the iOS side; we hope to release that within the next few months. Hi Steve, thanks for the clarification!